The instruments of the SPS series are fully automated, gravimetric vapor sorption analyzer. Sorption isotherm and kinetics are determined within a broad temperature and humidity range. The SPS combines an easy operation with a robust design for accurate and reliable measurement results. Unique features distinguish the SPS from common single sample instruments. The multi-sample capability of the SPS enables the analysis of up to 23 sample in a single measurement. The sample dishes are arranged in a circle on a sample carousel. An autosampler continuously places the samples one after the other on the balance for weighing. ProUmid uses micro and ultra-micro balances with top-loading technology. The specimen are simple places on the balance scale. No tweezers are required to get it suspended at the hook of the balance. An internal reference compensates any drift of the micro balance and thus providing excellent balance stability even for long term measurements (>>24h). The wide dynamic load range of the micro balances enables precise and reproducible weighing results at full scale from 3 milligram up to 220g. The masses of the samples usued in a measurement with more than one sample do not need to match. The masses of the individual samples may be totally different. The micro and ultra-micro balances of the SPS series are available with a gravimetric resolution ranging from 0.1µg to 10µg. For many applications, the sorption behaviour of materials at temperatures and climatic condtions far from room conditions is of interest. The large temperature range of the SPS enables to conduct vapor sorption analysis at extreme conditions from cool 5°C to hot 60°C. Relative humidity can be precisely set and adjusted over the whole range from completely dry 0% up to 98% RH close to condensation. The micro or ultramicro balance is easily calibrated with an automated routine using internal reference weights. Calibration of the humidity sensor is accomplished by using salt standards. For a more frequent and quick validation of the humidity calibration, Proumid provides a certified reference material. The SPS23-100 is a highly sensitive system with a gravimetric resolution of 100 nanogram. It is designed for applications where only very small amounts of sample material are available like in pharmaceutical preformulation. 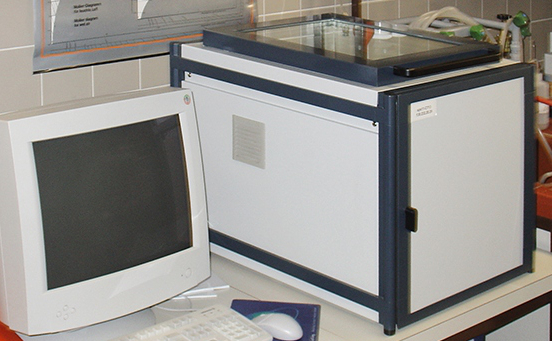 The instrument offers high sample throughput and excellent reproducibility between different samples. The plain and easy to clean surfaces as well as the simple straightforward operation qualify this system to be used with critical materials. 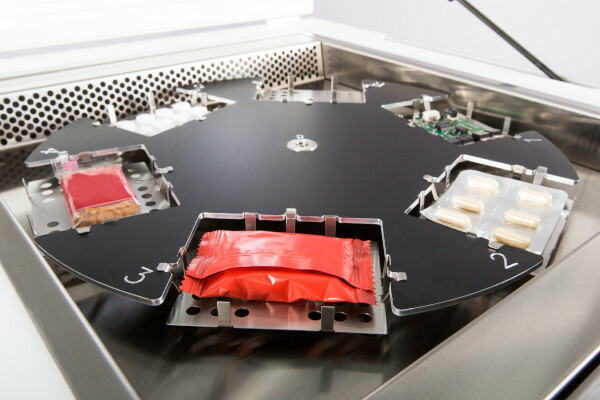 The SPSx-1µ Advance model shows best weighing peformance and a very high reproducibility of better than ±2µg at a gravimetric resolution of 1µg. Small and medium sized samples are measured at extremely high resolution over the full load range from 10mg up to 22g. The large available surface area of the pans ensures optimized sorptions kinetics. Due to its innovative sensor technology, the SPSx-1µ High Load achieves a very high resolution over a wide load range of up to 220g. In combination with the currently largest number of samples that can be measured simultaneously this system is the most powerful and versatile vapor sorption analyzer on the market. The SPSx-1µ High Load is compatible with all available hardware accessories. 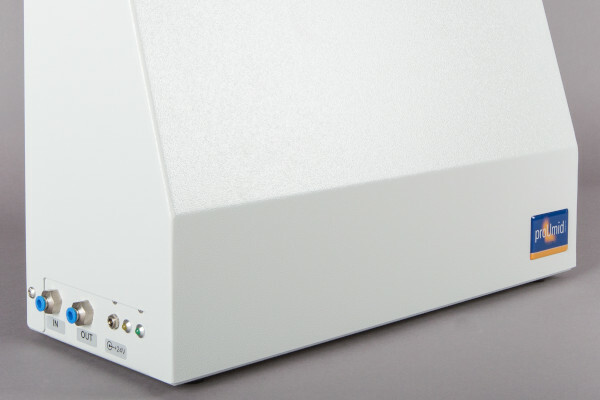 The SPS11-10µ system is a robust and easy to operate multisample vapor sorption analyzer. With the large load range of the balance, the system is perfectly suited for the analysis of bulky or heavy samples. Typical fields of application can be found in the chemical and food industry as well as in building physics and wood research. *Note: Maximum humidity is reched at chamber temperature close to room temperature. 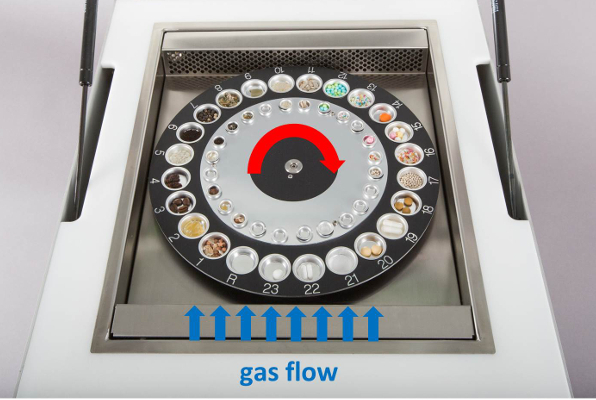 The sample carousel with the dishes arranged in a circle is placed in the temperature and relative humidity controlled measurement chamber of the instrument. 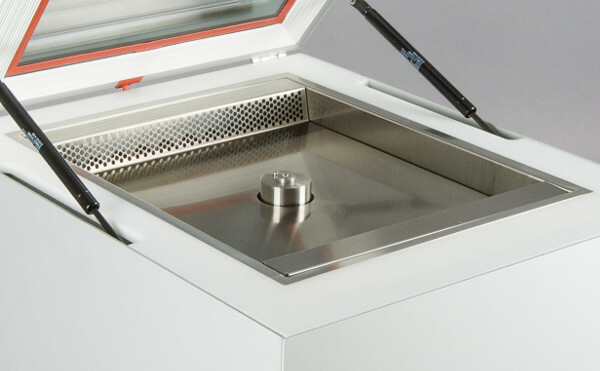 The atmosphere inside the chamber is continuously circulated, providing optimal air flow above the samples as well as uniform temperature and humidity at each point. All samples are weighed continuously. By turning and lowering of the carousel, one sample dish after the other is placed on the weighing pan. An internal reference eliminates all drift effects from the balance. 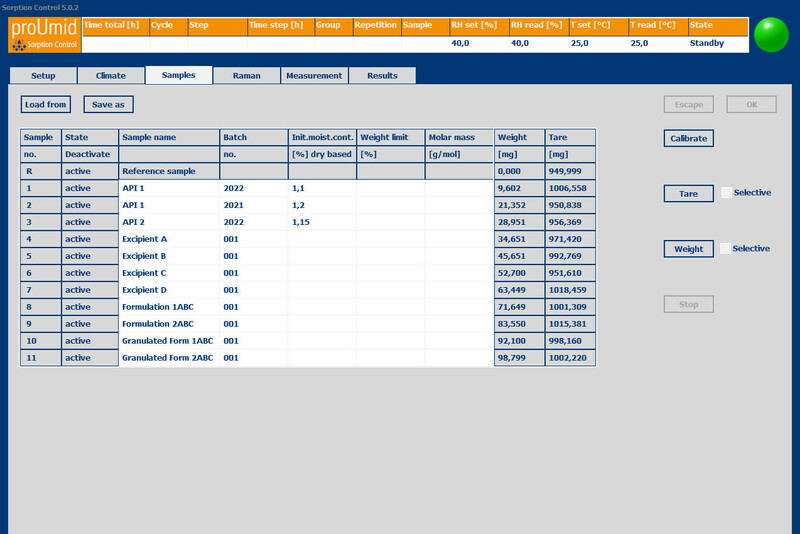 Operation of the SPS software ans preparation of a measurement is very easy, straightforward and user-friendly. First some basic measurement parameters like the equilibrium condition are set and the temperature/humidity profile for the sorption/desorption cycle is defined. Finally, after taring, sample material is filled into the dishes and the initial sample weight is recorded. Once the start button has been pressed, the measurement runs completely automated. The results are constinuously updated and displayed in tabular and graphical form. If necessary, the measurement settings can be adjusted during a running experiment at any time. The sample dishes are filled outside the instrument by removing the whole sample tray. By this procedure, staining of the instrument during filling is avoided. In case of an accidentally contamination, due to plain surfaces of the instrument inside, the measurement chamber is cleaned easily. The SPS systems are subject to continuous development and improvement. At the same time we take care that all hardware and software remains compatible with previous models. Even the oldest SPS at the University of Innsbruck (delivered in 1999) is still in operation every day – with the latest software version. A large range of extensions, sample trays and accessories is available for the SPS instruments. 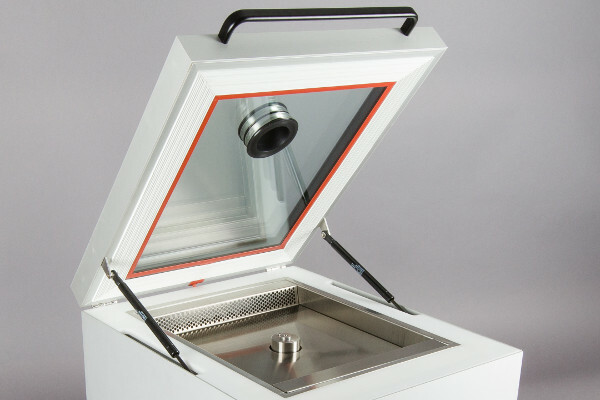 The glass cover of the SPS sorption analyser can be equipped with a heated sensor mount for the attachment of additional analytical instruments. Currently available sensor extensions are an imaging system and Raman Spectroscopy. Extension of the SPS vapor sorption analyzer with a video camera for visual inspection of samples during a sorption measurement. Extension of the SPS capabilities with a Raman probe for spectroscopic analysis during a running sorption measurement. Sample trays different in the number of sample positions and different in the sample pan size are available. A small amount of fine powder or granules can be measured as well as tablets, capsules and even large objects like electronic parts or pieces of wood. Sample kit for the determination of the water vapour permeability rate through foils and films. Vapor sorption analysis of large objects such as packages, blisters, concrete or insulation material. The optional membrane dryer provides sufficient dry air supply for two moisture sorption systems. 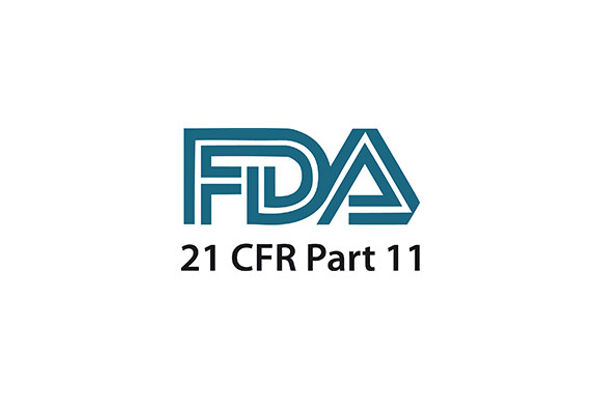 21 CFR Part 11 compliant software package.